LOS ANGELES (April 2, 2014) ¾ In its first quarterly report of 2014, the UCLA Anderson Forecast asserts that the harsh winter weather that ravaged much of the country caused slower than expected national growth in the first quarter of the year. However, the economy should rebound in the spring. Weather-impacted activities, such as factory production, automobile sales and construction, are expected to make up for time lost over the winter, leading to GDP growth in the 3 percent range. That rate is forecasted to persist through 2016, boosted by increased housing and business investments, as well as gains in consumer spending. The first forecast report of the year for California focuses on the recent drought, analyzing the impact of the dry weather and the complex relationship between the state's economy and its water supply. While the drought may affect certain agricultural sectors, the state overall will not be greatly affected by the unseasonably dry weather conditions. In a companion piece to the national and state forecasts, the UCLA Anderson Forecast team takes a hard look at a variety of problems plaguing the Los Angeles economy, including the high cost of housing and commuting, a poor environment for business and the relatively low education levels of the local population. In light of the nation's expected 3 percent GDP growth, UCLA Anderson Forecast Senior Economist David Shulman forecasts increases in overall job opportunities. In his report, he writes, "We can visualize the economy creating between 200,000-250,000 jobs a month with the unemployment rate dropping to 5.4 percent by late 2016 ... total payroll employment will surpass the prior 2007 peak, but the economy will remain well below its pre-Great Recession growth path." Shulman also expects an uptick in inflation, expecting the core consumer price index to increase from 1.8 percent in 2013 to 2.5 percent in 2016. As inflation rises, Shulman anticipates that wages will rise as well. "To be sure, for most Americans, the increase in wages will be most welcome," Shulman says. "But for those wary of inflation, it will be signaling a cautionary yellow light. Specifically, we are forecasting total compensation per hour to increase by 2.4 percent, 3.5 percent and 4 percent in 2014, 2015 and 2016, respectively, compared to a very low increase of 1.6 percent in 2013." Shulman also says that the Federal Reserve's long experiments with zero interest rates and quantitative easing are slowly coming to an end. He expects that the monthly $85 billion bond buying program, now at $55 billion, will be all but wound down by September. "We forecast that the Federal Funds rate will rise, to use 'Fedspeak,' at a measured pace, reaching 3 percent by the end of 2016," says Shulman. "In essence, the 'Yellen Fed' will be very much like the Bernanke Fed." The California forecast report, authored by UCLA Anderson Forecast Senior Economist Jerry Nickelsburg, examines the impacts that the ongoing drought and dry weather are having on the California economy. Nickelsburg examines the key economic components of a drought - demand, supply and a forecast of future drought conditions - and notes that in California there are four sources of demand: agriculture, fisheries and the environment, households and industry. Agriculture, by far the largest segment of demand, consumes about 80 percent of all delivered water. On the surface, rainfall and the transpiration of ground water appear to be the major components of 'supply,' but here water authorities may choose to pump more or less reservoir water to meet specific demands. Meteorological forecasts are relevant because the expected length of a drought affects both demand and supply. Nickelsburg notes that aridity and recurrent drought conditions are not, in and of themselves, detrimental to economic growth. Arid states have not seen their economies perform worse than states with more rainfall during the past decade. Because California and its residents have historically endured dry weather conditions, they have found ways to mitigate the impact of droughts. In fact, the amount of water used in Southern California is no higher now than it was 20 years ago, despite a much larger population today. According to Nickelsburg, while the drought has negatively affected California's economy, particularly in some agricultural areas, "Overall the state is not likely to be greatly impacted. But given our fragile recovery from the Great Recession, and the potential for this drought to drive industrial and agricultural structural change towards an adaptation to a more arid environment, a prudent incorporation of the drought impact would be to lower the forecast employment growth rates for the next few years by about 0.2 percent. This is more a recognition that disruptions are not without cost than a significant change in our economic forecast for the Golden State." The latest forecast for California calls for total employment growth (payroll, farm and self-employed) of 1.8 percent in 2014, 2.2 percent in 2015 and 2.1 percent in 2016. Nonfarm payroll employment is expected to grow at 2.2 percent, 2.3 percent and 2.0 percent for the three forecast years. Real personal income growth is forecast to be 3.1 percent in 2014 followed by 3.8 percent and 3.7 percent in 2015 and 2016. The unemployment rate for the three forecast years are expected to be 7.8 percent, 6.9 percent and 6.0 percent respectively, with the rate going as low as 5.7 percent by fourth quarter 2016. In a companion piece, UCLA Forecast Economist William Yu examines a variety of conditions plaguing the Los Angeles economy. These include the high cost of housing and commuting amid an unfriendly business environment. He continues his examination of the First 5 L.A./UCLA City Human Capital Index, which measures the education levels of various metropolitan populations. Yu's piece notes that Los Angeles has ranked near the bottom of major U.S. metropolitan areas in terms of job growth since 1990, joining only Cleveland and Detroit as cities with negative job growth in the last 23 years. 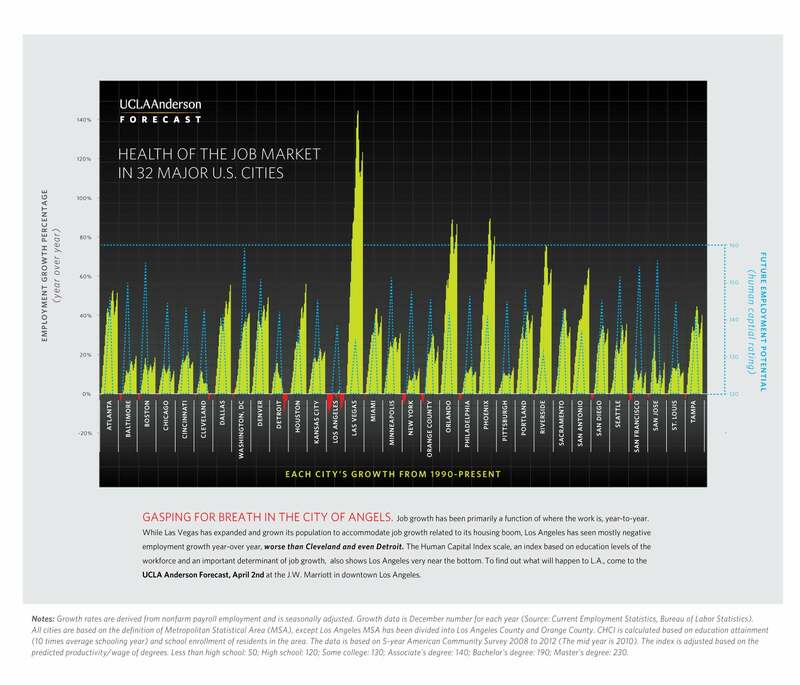 His report, titled "Problems and Solutions for Los Angeles' Economy: Human Capital, Public Education, and Migration," suggests that Los Angeles' economy is somewhat bifurcated, as better-educated West Los Angeles has had healthier job recovery compared to other parts of the city. Yu also proposes that Los Angeles advance its human capital by improving local public schools and finding ways to attract highly educated individuals to the city. Los Angeles could also find ways to become more business friendly as a means to create jobs for the less educated. Yu's report will be presented (along with the U.S. and California forecasts) at the UCLA Anderson Forecast's quarterly conference today, April 2, 2014, at the J.W. Marriott L.A. Live in downtown Los Angeles. The event's keynote speaker is Los Angeles Mayor Eric Garcetti. In addition, the event features a pair of panel discussions focused on job availability and job preparedness. Additional event details can be found here. UCLA Anderson Forecast is one of the most widely watched and often-cited economic outlooks for California and the nation and was unique in predicting both the seriousness of the early-1990s downturn in California and the strength of the state's rebound since 1993. More recently, the Forecast was credited as the first major U.S. economic forecasting group to declare the recession of 2001. Visit UCLA Anderson Forecast at http://uclaforecast.com. For a historical timeline of the Forecast, click here.